Girassol Charity Shop started at 69 Church Street, Antrim on 2nd May 2009 and is part of the registered charity TLC No. XT25631. The vision for the shop is to shine Christ's light, both in Antrim and in Mozambique, in south east Africa. Matthew 5:16 'Let your light so shine before men that they may see your good works and glorify your Father in heaven'. On returning from a 3 month trip to Mozambique in December 2008, Melvin and Sharon Kelly, then funding missionaries with OMS for Mozambique, felt God's prompting to initiate this project to provide funds for projects in Mozambique and be a centre for outreach in Antrim. So they set up Girassol Charity shop. The name Girassol was chosen as it means sunflower in Portuguese reminding us to shine Christ's light. The fundamental motivation is to encourage one another to love God and love others (Matthew 22v36-40) both locally and in the country of Mozambique. The shop provides a great opportunity for local believers to be involved in the church's missional task in a practical and meaningful way. Girassol operates under the umbrella of the registerd charity TLC - Transforming Lives and Communities. At Girassol we gladly accept donations and sell a wide range of products. 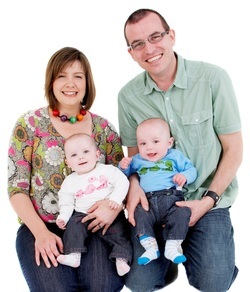 Melvin and Sharon Kelly along with their twin babies, Abigail and Joshua left Northern Ireland to return to Mozambique on the 20th September 2010 where they serve with OMS International. Noah was born in March 2012 and this leaves Melvin and Sharon very busy with their little ones and full time ministry in Mozambique. Their vision is to empower the Mozambican church to reach out into their communities with the transforming message of the Gospel. Integral to their ministry is helping Mozambicans develop sustainable holistic compassionate outreach. Their prayer is that God's Kingdom will come & His will be done in Mozambique. The Kelly family are currently on home assignment in Northern Ireland and will be taking bookings for meetings from October onwards. They are also expecting the arrival of their fourth child in November 2013.